Rabbi Raymond Apple is chief rabbi at the Great Synagogue in Castlereagh Street, Sydney. 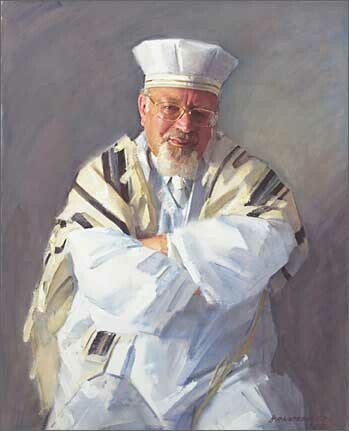 Robert Hannaford’s portrait of him was a commission to commemorate the Rabbi’s 30 years of service to the congregation. Hannaford was flown up to Sydney where he stayed in a hotel close to the synagogue. They hired two rooms and it was there that Hannaford painted the portrait. Born in 1944, Hannaford lives and works in Riverton, South Australia. A largely self-taught artist, he is acclaimed for his portraits but also paints landscapes and nudes and is a sculptor. His sculpture of Sir Donald Bradman stands outside the Adelaide Oval. He won the Doug Moran Portrait Prize in 1990, the Fleurieu Landscape Prize in 1997 and the Archibald People’s Choice Prize in 1991, 1996 and 1998. He has been hung in the Archibald Prize on 12 previous occasions.